Quoted From Wikipedia, the free encyclopedia. Heron Island is a coral cay located near the Tropic of Capricorn in the southern Great Barrier Reef, 80 km north-east of Gladstone, Queensland, Australia, and 460 km north-north-west of the state capital Brisbane. The island is situated on the leeward (western) side of Heron Reef, a fringing platform reef of significant biodiversity, supporting around 900 of the 1,500 fish species and 72% of the coral species found on the Great Barrier Reef. 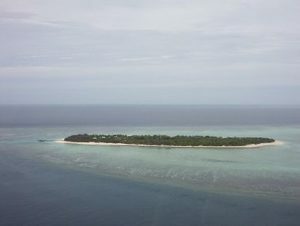 The island is about 800 metres (2,600 feet) long and 300 metres (980 feet) at its widest, giving an area of approximately 16 hectares (40 acres). The highest point, near the western tip, is 3.6 metres (12 feet) ASL. A dune ridge along the southern shore rises some 3 metres (9.8 feet) ASL, lower dunes on the north-eastern side are only about one metre (3 ft) above the sea. Access is via boat or light aircraft. If diving, it is strongly recommended to use the boat. It is cheaper and will not have the weight restrictions that a light aircraft has.